Republican frontrunner Donald Trump celebrated decisive victories in Michigan, Mississippi, and Hawaii on March 8, by bringing Trump products on stage at the Trump International Golf Club, in Jupiter, Florida. 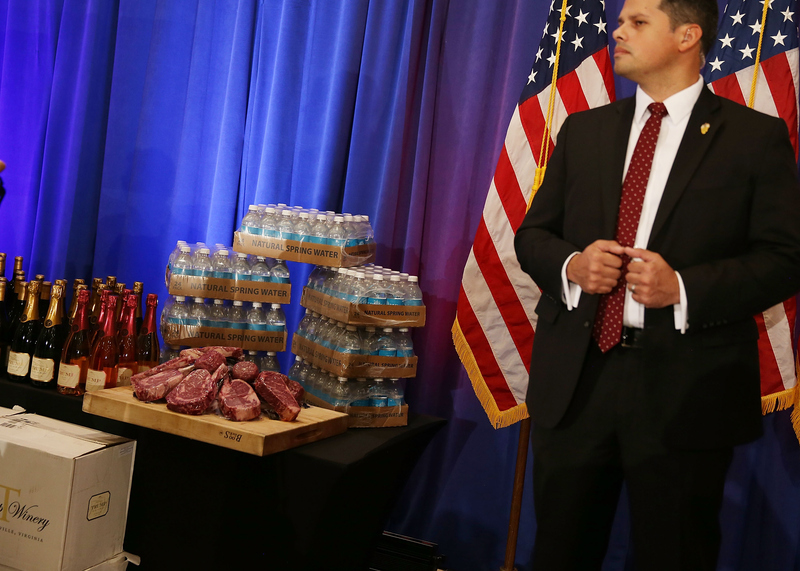 Those products included Trump Steaks, Trump Water, Trump Wine, and Trump magazine. He even threw a copy of the magazine into the audience from the podium. The products were brought out in direct response to Mitt Romney’s criticism last week. The products were brought out in direct response to Mitt Romney’s criticism last week. At a press conference, Romney said that Trump was a “phony, and a fraud,” and not an effective businessman, naming a list of Trump’s failed business ventures. Trump plugged his products disputing the claim made by Romney that the businesses failed. Trump also responded to criticism about Trump University, dismissing the controversy as small lawsuit that he could settle at any time. In what amounted to a part victory speech, part press conference, and part infomercial, the real estate mogul held the stage for over an hour, showcasing his flare for showmanship. In that hour he chastised reporters, mocked his rivals, and called out to retired Yankee legend Paul O’Neill who endorsed him from the audience. His victory speech included boasts about poll numbers, high turnout by first-time voters, and broad attacks at nominees Sen. Ted Cruz, Sen. Marco Rubio, and former Secretary of State Hillary Clinton. It was a more sedate victory speech than at his larger rallies and covered immigration, trade, and a call to unify the Republican Party. He also brought up a conversation he had with Speaker of the House Sen. Paul Ryan, who spoke out last week against Trump’s racial divisiveness. Trump won in Mississippi, Michigan, and Hawaii by double digit margins. Trump won in Mississippi, Michigan, and Hawaii by double digit margins. In Michigan, Trump won by a 12 percent margin, with 36 percent of the vote. Cruz and Ohio Governor John Kasich split the rest of the vote with each getting 24 percent of the vote. Ted Cruz also won one state, Idaho, with 45 percent of the vote to Trump’s 28 percent. In the larger picture of the election, Trump won 71 delegates in the primaries and caucuses on March 8, and maintains a healthy delegate lead over the competition. Currently, Trump leads with 458 delegates to Cruz’s 359 delegates, according to Real Clear Politics. Rubio and John Kasich trail with 151 delegates and 54 delegates respectively. The magic number for a Republican candidate to reach is 1,237 votes for the nomination.